How can game studios create games that are not only fun, but are also educational? While there have been scores of educational games released over the years, the genre seems to be lacking clear definitions of exactly what an educational game is, and what it should accomplish. 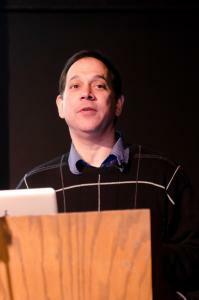 NYU’s Dr. Ken Perlin and his colleagues at the Games for Learning Institute are aiming to change that. Perlin, a member of the Centre for Digital Media’s advisory board, was at the Centre last week giving a presentation on augmented reality. After the talk, he shared some of his thoughts on the work Games for Learning has been doing in the past few years. Established in 2008 with the help of a grant from Microsoft Research, the Games for Learning Institute brought together researchers who had been investigating how to make educational games more effective. Among them are Dr.’s Jan Plass (NYU), Chuck Kinzer (Columbia), Katherine Isbister (NYU/Poly), Bruce Homer (CUNY), and Dr. Perlin, of course. The group came together with the goal of putting some solid scientific research behind educational game design. Perlin identified the central question: “what factors in game design have what kinds of impact on their use as instruments of education?” In order to navigate the “complex landscape” of subjects and students, the group designs and tests mini games to see what works, what doesn’t, and more importantly, why. The group hopes to create a body of knowledge for commercial game developers to draw on when creating educational games. The group has been hosting workshops with game developers, sharing the principles and findings learned throughout their research. Currently, there are studios creating games informed by the research, although Perlin was unable to disclose who, though he did note that they were companies that audiences would certainly be familiar with. Ultimately, the group hopes to influence industry and academic stakeholders as well as policy-makers by showing that educational games can empirically be shown to be effective, provided they have the right elements embedded in them. When asked if there would be interplay between his recent augmented reality work and the research that Games for Learning has been doing, Perlin noted that there could be some overlap in the future. If recent developments in media and interactivity are any indication, such a development could bring with it unprecedented capabilities for learning. As Dr. Perlin noted in his presentation to students, who would have thought 30 years ago that we’d be shooting lasers into our eyes to correct our vision? Similarly, the prospects for an emerging discipline such as this are exciting to say the very least.